I like a synth-pop band? As I was perusing the bonjovi.com online store (hey, I’m from New Jersey, what can I say), I came across their Collectible Wine section. Somehow, I don’t see Bon Jovi fans paying $100 for a commemorative Have a Nice Day zinfandel. But maybe I’m wrong. I also think the Slippery When Wet commemorative Chardonnay was Richie Sambora’s idea. He seems like he’d enjoy the innuendo. Why does my beer smell like skunk? 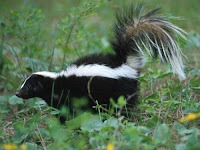 My most recent article for Chow.com, on why beer gets skunked, was just posted here. Check it out. And, according to my research, pilsners in and of themselves are not more susceptible to skunking (that was added in the edit). Charlie Bamforth, professor of brewing science and chair of the Food Sciences and Technology dept. at UC-Davis, indicated that there aren’t any particular hops or types of beer that skunk more easily. It really just boils down to the color of glass used in the bottle. Although I’d guess that since pilsners and lagers have a more delicate taste, it’s easier to detect the skunked flavor in them. I was just reading about a Lemon-Thyme Gimlet, on Slashfood, and the author mentioned that he started drinking gimlets after reading about them in Raymond Chandler novels. That’s why I did, too. Philip Marlowe made them sound so damn cool. I prefer mine like Marlowe’s–Rose’s lime juice, not fresh. It made me wonder what other food and drinks I’ve tried just because I’ve read about them in a novel.